Some of the terms we use can be confusing, so we've prepared a glossary that explains them. If you think we've missed something, just email or call us and we will add it. RUVA is a common term used to describe HO (high output) ultraviolet lamps that have built in reflectors. (The image left is a cutaway view) The term that is sometimes used for VHO (very high output) lamps is VHOR, but RUVA is just as accurate. Speaking of accurate, the reflector works for UVB just as well as UVA, but it was coined originally for lamps that were mainly UVA. As you can see from the cutaway, a reflector is poured inside the lamp before the phosphor is added. This forces all the light out in one direction, increasing the output of the lamp by 35%-50% or more. The amount of reflector is measured in degrees. A 180 degree reflector is one that is exactly half the circumference of the lamp, and is most common. Larger reflectors of 210 to 230 degrees are also common, meaning that the opening that the light can escape is less than half the circumference. These are sometimes called "aperture lamps". Lamps with reflectors of less than 180 degrees also exist but are just called RUVA lamps. Almost all Solacure lamps are RUVA designed because it only costs a few more dollars to install this reflector, yet increases the power greatly and often removes the need for any external reflector system, saving you money from the start. Different countries define the ranges a bit differently, but we define UVA as wavelengths from 400nm to 320nm, UVB as wavelengths from 320nm to 280nm, and UVC as wavelengths from 280nm up to 100nm. UVA penetrates more deeply than UVB, which penetrates more deeply than UVC. UVA causes little immediate damage to skin and materials, UVB causes fairly rapid damage, UVC causes instant but superficial damage. All are very damaging to the eyes. While the Sun produces lots of UVC, none of it reaches the ground, instead being filtered out by the atmosphere. Of the remaining UV that reaches the ground, about 5% of it is UVB and 95% of it is UVA. Solacure lamps have ratios that vary wildly, from 0% to 100% of either UVA or UVB, depending on the application and lamp design. The ratio doesn't tell you the total strength but it does give you information about the characteristics of the lamp. None of our standard lamps emit UVC, which requires very special environmental controls to prevent damage to humans. As a point of interest, UVC is used for water purification in a number of major city water supplies, as it kills all microorganisms. The ISO sizing of lamps is a little confusing at first....and even after awhile, but for what we do here, we can make sense of it. It can be broken down into two number, the F number and the T number. The T number is easy, it is the thickness of the lamp (diameter) in 1/8th inch increments. For example, a T8 lamp is 8/8ths of an inch in diameter, or 1 inch. A T5 is 5/8th of an inch. A T12 is 12/8ths, or 1.5 inches in diameter. The F number (F standard for "fluorescent lamp") can mean wattage or length, which is confusing as often it means neither. Lamps that are designated F32T8, F34T12 and F40T12 are all 47" long, ie: designed for 4 foot fixtures. The F number stands for the wattage they are designed for. On the other hand, F71T12, F72T12 and F73T12 lamps are all around 6 foot long and designed for 100 watt HO (high output) systems, so they don't follow the same method. F54T5 are 4 foot long, very high output (50 watts) and designed for special 4 foot fixtures. If you add an R to the name, ie: FR32, that means it has a built in RUVA reflector. To make this more confusing, our FR32T8 lamps are designed to run on 32 watts all the way up to 60 watts. They are multi-wattage lamps. In truth, most fluorescent lamps will work on a variety of wattages, but are designed to run best at a particular wattage, hence their rating. Most Solacure lamps are either FR71T12, FR32T8 or FR54T5 lamps, although we also have some F59s and other odd size. 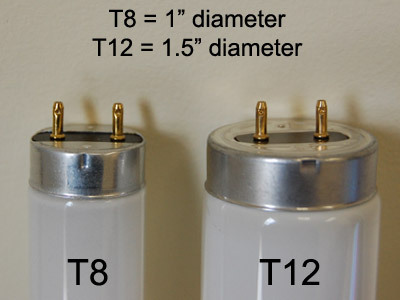 Note that T8 and T12 lamps use the same pins and pin spacing, so they can use the same lamp holders. It is what it sounds like it is: putting a stress on the plant. In our case, it means exposing a plant to UVB to just barely damage it, forcing it to react by producing chemicals to protect itself. In the case of tomatoes, peppers and the like, they produce flavonoids which act as sunscreen, and as you guess, also add flavor to the fruits. In the case of cannabis, it increases THC production at the trichomes, which is a clear liquid that protects the flower from additional UV exposure. With all plants, you are making it take energy away from plant growth and instead spend that energy on plant resins. This means the fruit will be slightly smaller, but much more flavorful and/or potent. Pretty much what you would think, a lamp that produces a single frequency. To our eye, a narrow band UV lamp and a full spectrum UV lamp look about the same, as we can't see UV. The visible light from the lamp is incidental, and we put no visible light phosphors in our lamps. In practice, a narrow band lamp is going to be much, much stronger in its single frequency because all of the available energy is being used to create that single range of frequencies. A standard lamp (wide band) actually produces light at multiple peaks, typically 3 to 5 but it can be more or less. The output is lower at this points, but it covers a broad range, as all peaks look kind of like mountains, and drop off from the designated "peak". Which is better? Neither. Narrow band are best for some applications, wide band are better for others. Typically, UV curing is more likely to use narrow band as the activators have a range they work best in, and horticultural users like wide band so as to simulate the sun, but there are plenty of exceptions. For example, our Universal UV is a wide band lamp and the majority of customers that buy it do so for slow/deep curing of finishes, particularly building materials. They aren't "better" than each other, just different. All the lamps we sell are bi-pin, meaning they have two metal pins at the ends. There are some fancier connectors, like life is much simpler with bi-pin, and it means you can use off the shelf parts. There are also single pin lamps, like the 8 foot fluorescent lamps you see in warehouses, but we can't use that configuration as virtually all of our lamps have built in reflectors, thus requiring two pins to hold the lamp in a specific orientation. Single pin adapters would let them spin around, which is fine for regular lamps but not for reflector lamps. A ballast acts as a current limiter for fluorescent lamps. Incandescent lamps have a resister in them (the filament) that limits current, but fluorescent lamps will keep drawing power until they explode unless you limit the power coming to them. This is the job of the ballast, and why you have so many ballasts, as you have so many different types of fluorescent lamps. You can not operate any fluorescent lamp without a ballast of some kind. The ballasts we recommend and sell are the newest generation of high frequency electronic ballasts that are designed to get the most power using the least amount of electricity. In particular, the SunHorse ballast is designed specifically for ultraviolet lamps, and will get more UV per watt than any other ballast on the market. I just want to clear up this, as this is a misunderstood word. In relation to UV lighting, a reflector is the device that bounces back light waves, whether it is inside the lamp (see RUVA above) or it is a shiny piece of aluminum. The device that holds the lamps and the ballast is what we call a "fixture". Some people call that a "reflector", but the reflector is just a part of that device, and in all cases, is completely useless for reflecting ultraviolet. The white paint they use reflects visible light just fine, but it absorbs UV, which is why we put proper reflectors inside almost all our lamps. Trichomes are hair-like structures that grow on a number of plants. The most obvious examples are the Nightshades (Solanaceae) such as tomatoes and many peppers, as well as cannabis (marijuana), both sativa and indica. 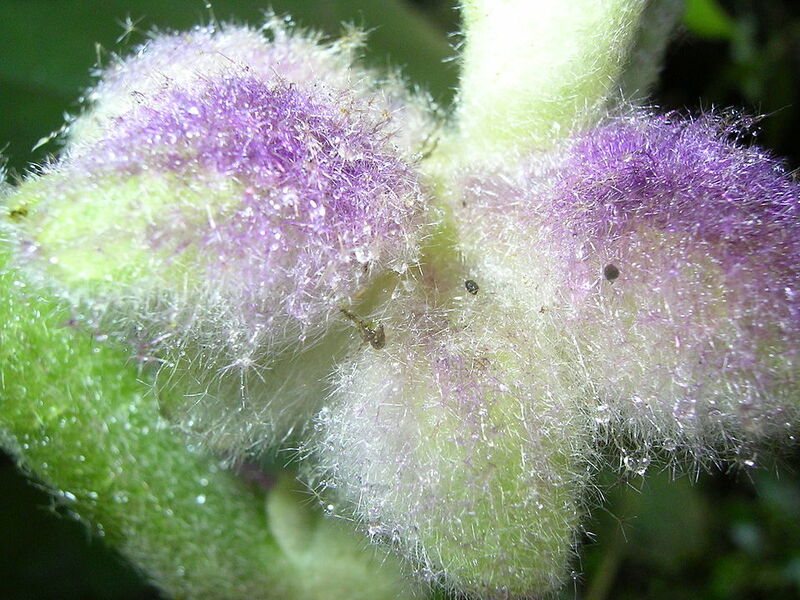 The example in this photo is the flower bud of the quito plant (Solanum quitoense). Note that both the stalk and the flower have these hairs, although the fruit does not. Compare that to cannabis, which only has trichomes on the flower itself, and perhaps the small leaves nearest to the flower. To further compare, tomatoes and peppers only have trichomes on the stalks of the plants, where they are often prickly. While all these plants have different kinds of trichomes, they all act in a similar manner in that they are all hair like structures and they all exude plant resins of one kind or another. It is the hairs themselves that are called "trichomes".